Club members work together to organise events and projects to raise funds for worthy charitable causes. We regularly receive requests from individuals looking for sponsorship for their own events, or towards them volunteering overseas and seeking financial assistance. The club does not have the financial resources to make grants to individuals and any such requests will receive a polite negative reply. End Polio Now campaign. 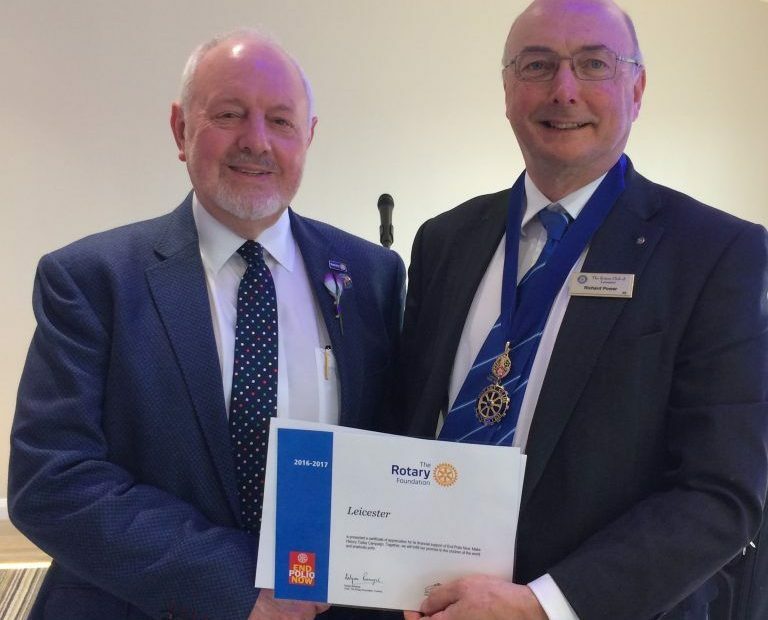 Rotary International Foundation Co-Ordinator, Peter Moralee, is pictured presenting a certificate, congratulating the Leicester Club, to President Richard Power in recognition of our support of the Rotary’s Worldwide Polio Eradication programme. The programme has been in operation from 1986, when there were 350,000 reported cases of the illness, to just 22 in 2017. The work will carry on until the long-awaited zero is achieved.